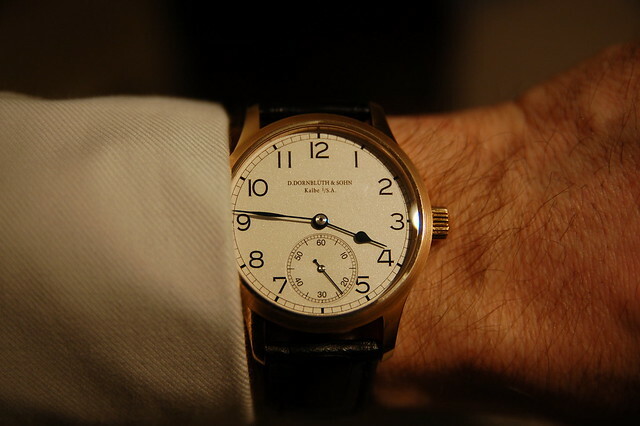 D.Dornblüth & Sohn Forum » Opinions, Questions and Pics » My watch » A Rare Gathering! Three 04.0s in one place, at one time. These photos speak for themselves. Enjoy! Wow, almost 5% of the world's supply of 04.0's. Are you trying to corner the market? This photo includes #14 which is the same one listed for sale in tee530's post from yesterday. Are all three 4.0s held by the same owner? watch1 wrote: This photo includes #14 which is the same one listed for sale in tee530's post from yesterday. Yes, they are today (the listing that tee530 posted is stale). But one of them is on its way to a deserving and enthusiastic new home! The beautiful #14 has arrived at its destination - with new owner in Amsterdam. It looks absolutely magnificent after a thorough spa treatment with Dirk. The man is a legend. To have designed and built such a beautiful piece and then to service customers to fantastically is absolutely unique. Many thanks to Dirk and his family (team) for getting the watch to my wrist in time for Christmas. If I can ever work out how, I'll post some pictures here. Special thanks and a mention in despatches go to Roger the Dornblogger for his role in putting me in touch with #14. I am now a proud member of the gang! Thanks to both Dirk and Roger. Wear that watch in good health. It's a keeper! On the off chance you want to dispense with one of the remaining two 04.0s, I certainly would be interested! Either would be a joy to own and wear. TimeZero wrote: On the off chance you want to dispense with one of the remaining two 04.0s, I certainly would be interested! Either would be a joy to own and wear. Sorry James. I worked too hard on those two to ever let them go! 10 Re: A Rare Gathering!